An enormously popular gladiator based out of Tolosonya, who also has his name on a restaurant that King Avramson flies to once per month. Gavin meets Beef Supreme and spars with him when he travels with the King- see the log Rise of the Brotherhood. 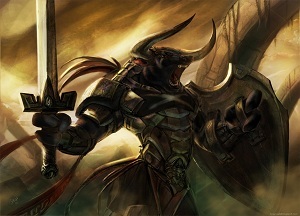 CrIsis witnesses a rare defeat in a gladiator battle for Beef Supreme against the Havean general, Tinor. See the log Drauka the Diver.